Double Deep or Deep Reach Racking is the placement of a row of standard pallet rack behind another. A wise choice for increased density in situations where you may typically have 5 or more pallet loads of any particular identical product. This system; however, also necessitates the use of a specialized Deep Reach lift truck. This type of racking system can be manufactured using either our roll formed racking or our structural racking product. Using a deep reach lift truck, an operator places one pallet into the system first, then another in front of it, enabling twice as many pallets to be stored for a given number of aisles. This increases productive use of floor space about 60% to 65%. 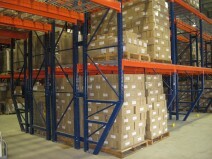 Deep storage rack has become a very popular choice in “high throughput” operations.